"The National History of the Iranian people"
One of the strange features of Iranian history is that from the time of the Sasanians, perhaps originating with the Parthians, a rather different version of their national history was told by the Iranians themselves. Something was said about this at the start of the course (see here) - but, because it's this story, rather than the one told by modern historians, that became central to the Iranians' view of themselves, it's important to know about it. The Khwaddy-namag, the "Book of Lords". Compiled during the reign of Yazdegird III, it told the story of the Iranians from their beginnings to Khusrau II. It doesn't survive, except in stories taken from it by later Islamic historians and Persian poets. The Annals of al-Tabari (who died in 932). His sources included an Arabic translation of the Khwaddy-namag. 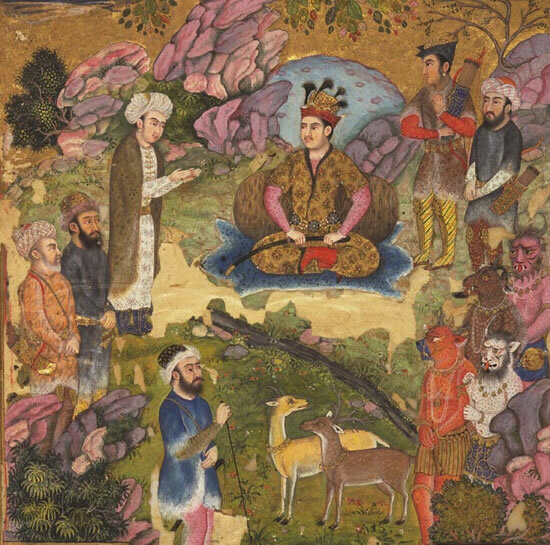 The Shahnameh ("Book of kings") of Abolqasem Firdowsi which he finished in around 1010. It's based on a Persian prose compilation deriving from an Arabic version of the Khwaddy-namag, but includes a lot of legends and stories from other sources. He wove it into a long epic poem in Persian - but he's a poet and story-teller, not a historian. Bundahishn, an extensive collection of Zoroastrian writings on the creation of the universe, the gods, and mankind. Written in Persian in around 900 - 1000, although the oldest manuscripts are from 16th century. How is the "national history" different from the history as told by modern historians? The national history, as handed down by Firdowsi and others, doesn't make any distinction between fact, legend and myth. The early history all comes from eastern Iran - nothing is known of the Achaemenids and events in Persis. The Zoroastrian religion flavours the narrative. Man was created by Ahura Mazda for a reason: to join him in the struggle against Ahriman and the forces of evil. There is no external timeline - the national history is simply the stories of what happened in the reigns of the 60 or so kings. Successful kings have the blessing of Ahura Mazda (known as farr in Persian) - they must protect and guide the people with help from Ahura Mazda and other divine beings. Many of the reigns are unfeasibly long - resulting from attempts by Zoroastrian priests to divide the narrative up into "millennia". In the Iranian idea of history, finding out the facts is not important. What is important is to promote and reinforce the ideals of the nation of Iran. Kings are to be obeyed, heroes to be admired and copied, so that national pride can be passed on, and the wisdom of the past can benefit the future. [Does it sound a bit like Michael Gove's educational policies in the UK in 2013?] So there's nothing wrong with a bit of exaggeration - the details are less important than telling the story in an exciting and convincing way. We'll give the bare bones of the story: you should read Firdowsi to get the full flavour. The Heroes: the Kayanian kings. The historical era, which begins with Alexander. Iranian national history tells the story of the 60 kings who ruled from the beginning of the world up to Khusrau II. It combines fact, legend and myth into a national Iranian narrative, which emphasises the importance of good kings, whose farr (divine grace) leads them with the help of Ahura Mazda and other divine powers to fight off the challenges of the evil Ahriman and his henchmen. The first millennium starts with Kayumars and ends with Jamshid. The second millennium is the 1000 year rule of Zahhak. The fourth millennium was due to end with the coming of a saviour - instead it coincided with the coming of the Arab conquerors. The world is due to end at the end of the sixth Millennium.